El boletín Amphibian Ark (Arca de Amphibios) ahora es disponible en español! Nos complace anunciar que, a partir de la próxima edición del boletín AArk, estaremos ofreciendo nuestro boletín de noticias tanto en inglés como en español. Si desea suscribirse a la versión en español del boletín, por favor haga clic en el botón de abajo e inscríbase al boletín de español. Estamos seguros de que nuestros lectores españoles apreciarán esta nueva iniciativa. Nos gustaría transmitir un agradecimiento enorme para Silvia Flores, quien ha ofrecido generosamente a traducir los boletínes para nosotros cada trimestre. 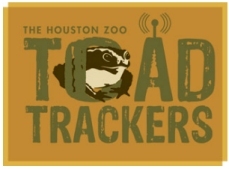 Houston Zoo received a grant from Texas Parks and Wildlife to begin a new conservation education program called Toad Trackers, and they have recently completed their first two classes. In the Toad Tracker program, teenagers are monitoring wild Gulf Coast Toads (Bufo nebulifer) within the zoo grounds. It is a series of classes in the classroom and in the field, and they also learn about global amphibian declines, in addition to the field training which focuses on collecting morphological, environmental and geographic data (GPS). The students are thorougyl enjoying themselves so far, and hopefully, are taking away important messages about looking after the environment and amphibians in general. The program also includes a post analysis session after the field training, which includes organizing and answering the data they collected and they must answer several conservation discussion questions. They have to do this to become a certified expert “Toad Tracker”. This is another example of a great program developed by zoos to help conserve the world’s amphibians – what programs are your zoos involved with? I was invited to speak to a kindergarten class at Mary Queen of Peace in Webster Groves. The class mascot, “Hoppy,” is a stuffed frog that is dressed as either a male or female depending which child takes him/her home at the end of each week. I mentioned to the teacher that some frogs are being feminized due to industrial waste and chemical dumping and that they are born with both male and female genitalia. I assured her that I would not share THAT interesting fact with the room full of five year olds. The first thing we did to get the kids in the mood to talk and learn about frogs was to have them cut and assemble frog hats. These consisted of long green construction paper strips laid out in front of them. The children had to glue-stick on two big eyes – white circles with black dots in the center of the circle. These were glued in the middle of the strip. They had to attach two legs close to the eyes and two legs near each end of the strips. They drew a black squiqqly line under the eyes. The piece de resistance was a long red tongue pasted on the mouth on which the children happily slapped a small fly sticker. Because the tongue hung down over the bridge of each child’s nose and two of the legs hugged the child’s temples – I found myself addressing a roomful of mini-gladiators. After the bands were wrapped around each of the children’s heads and taped securely, I asked the class who knew where frogs came from. Several arms shot up eagerly accompanied by “Oh! Oh! I know!” I pointed to one of the uniformed children: “Oh! Um…Um..I forgot…..” “Wrong answer!” I replied and pointed to another frantically waving child who shouted “EGGS!! !” I asked what came after the eggs which caused arms to start waving frantically again. “Yes?” I asked a cute little girl. “Tadpoles” she responded confidently. And so the questions continued covering topics such as where frogs lived and what hurts frogs. This latter topic was met by silence. So we proceeded to the “hypotheses testing and biology lesson” part of the program. Twenty-two frog crowned children squeezed around a table that held a glass bowl filled with water. In the bowl were three small globs of petroleum jelly representing “tadpole eggs” and a pink hard boiled egg. I asked the kids if they knew what kind of egg sat in the middle of the bowl. They shouted “Oh! Oh! I know!! I know!” I said okay, tell me what it is! They shouted in unison “An Easter egg!” (well that’s all I had at home!). I said yes of course, but what was it beside that. We eventually got around to the fact that it was a chicken egg which has a hard shell as do many other bird eggs, reptiles, etc. The point was they could see that the chicken egg was hard and the “tadpole eggs” were porous and vulnerable. I took a small bottle of blue food coloring and squeezed several drops into the bowl as I asked the children what they thought would happen to the two types of eggs. This elicited several hypotheses, a couple of which were correct: that the dye would soak through the tadpole eggs. When asked what would happen to the tadpoles inside, all agreed that they would be hurt in some way or “maybe even die”. The dye beaded up and lingered on the petroleum jelly confirming their guesses. I lifted the chicken egg out of the blue water, wiped it dry and showed them that little or no color clung to it. After the kids were quietly sitting back at their small tables, we proceeded to talk about global warming, habitat destruction, chemical/pollution dangers and how frogs are both predators and prey. To sum up the lessons, I gathered the kids in their carpeted reading corner and had them sit down. I took three kids from the group and explained that everyone sitting down represented frogs that had already disappeared and that the kids standing next to me represented frogs that would disappear soon unless we helped them. I spoke with the teacher the next afternoon who called to thank me again for talking about the frogs. She said that at morning prayers, a little boy said “I want to pray for my friend Robbie’s dad and the frogs”. This was followed by several “Oh! Oh! I want to pray for the frogs, too! !” And they did. Amphibians are our planet's canaries in the coal mine. They face the most significant mass extinction since the dinosaurs. The main reason they will disappear is because we will choose to allow it. You can be one of the people who stops it. Visit www.amphibianark.org. Learn. Donate. And tell others about it. Canary in the coal mine: are frogs warning us about what's in our air?